With abundant offshore reserves of oil and gas, the West African region has been registering a substantial demand for energy for the exploration and production procedures, creating a significant need for offshore mooring systems that can monitor and control marine fuel consumption in this region. Apart from this, the trend of shallow water exploration is now shifting to deep-water and ultra-deep waters for the western offshore of Africa due to the current market scenario and fluctuating crude oil prices is also reflecting positively on the West Africa offshore mooring systems market. Over the coming years, the presence of ample untapped areas for oil and gas exploration and production and the introduction of technologically-enhanced mooring products are expected to increase the demand for offshore mooring systems, influencing this market greatly. In 2015, the market stood at US$169.70 mn. Progressing at a CAGR of 4.90% from 2015 to 2024, the market is expected to rise to US$470.2 mn by the end of 2024. Catenary systems, semi taut-leg systems, taut-leg systems, spread mooring systems, single point mooring systems, and dynamic positioning are the key types of offshore mooring systems available in West Africa. Currently, spread mooring systems have been witnessing a greater demand than other systems. Researchers project this scenario to remain so over the forthcoming years. Floating drilling, production, storage and offloading (FDPSO) vessels, floating production, storage and offloading (FPSO) vessels, floating liquefied natural gas (FLNG) vessels, semi-submersibles, tension leg platform, and SPAR platforms have surfaced as the main application areas of offshore mooring systems. With a share of 43.55%, the FPSO vessels segment led the West Africa market in 2015 and is anticipated to remain doing so in the years to come, owing to the increasing requirement for storage and refining of crude oil and natural gas in West Africa. Offshore mooring systems are also anticipated to witness a significant rise in the demand from SPAR platforms and semi-submersibles for deep and ultra-deep waters over the next few years. Mauritania, Senegal, Guinea, Ivory Coast, Ghana, Cameroon, Equatorial Guinea, Gabon, D.R. Congo, Angola, and Congo Brazzaville are the primary domestic markets for offshore mooring systems in West Africa. With a contribution of US$45.1 mn, Angola led the overall market in 2015 and is projected to retain its position in the near future. Apart from Angola, Ghana, Gabon, and Ivory Coast are also expected to emerge as lucrative markets for offshore mooring systems in West Africa over the next few years. The increasing emphasis on energy security, ongoing exploration and production activities, and the rise in investments are likely to boost the markets for offshore mooring systems in these countries in the years to come. The multiple initiatives taken by the governments in various West African countries, in partnership with leading global players, to expedite ‘bright prospects’ and to increase exploration and production of oil and gas are projected to influence this market further in the near future. As mooring systems are entering into more advanced stage with automation and satellite governing techniques for better and safer mooring analysis, their demand in anticipated to increase phenomenally in West Africa. SBM Offshore N.V., MDEC Inc., Grup Servicii Petroliere S.A., Mampaey Offshore Industries B.V., FMC Technologies Inc., BW Offshore Ltd., Trelleborg Marine Systems, Timberland Equipment Ltd., Mooring Systems Inc., and Delmar Systems Inc. are some of the leading players in the West Africa offshore mooring system market. 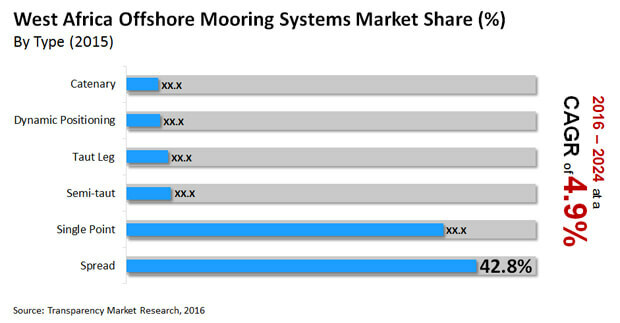 The market research study analyses Offshore Mooring Systems Market for West African region. It provides market estimates in terms of revenue expressed in US$ Million for a forecast period from 2015 to 2024. The report study thoroughly recognizes major drivers, restraints, key opportunities and analyses their impact on the market for the forecast period. The report provides in depth analysis of Porters Five forces and also identifies value chain of the offshore mooring systems market for the West African region. Offshore mooring systems assists anchorage of marine assets including vessels, barges, tugs and support vessels. Mooring is a permanent structure on which a vessel is secured or tied in. A mooring system collectively stalls free movement of a ship on water thus assisting it for its specific and desired use. Offshore mooring systems fixes the position of a vessel relative to a point on the sea-bed without any connection to shore. Mooring system includes anchors, mooring lines, shackles, steel/synthetic wires and chains. Vessel type and environmental conditions like wave / drifting forces, swell, wind & current forces determines component and equipment’s to be used in a particular mooring system. Recent fall and fluctuations in global crude oil prices has not deterred exploration activities in West Africa. The demand for energy, especially from exploration of oil and gas, is constantly on the rise. Major offshore production facilities are in Gabon, Angola, Ghana, Congo Brazzaville and Ivory Coast. New projects are also underway in this region which are expected to provide positive growth opportunities for the offshore mooring systems market. Most of the global major players in offshore mooring systems are entering West Africa offshore to expand market presence. Based on the type of mooring systems, the catenary, taut leg system, semi-taut system, single point mooring, spread mooring and dynamic positioning are also expected to augment the West African offshore mooring systems market. Based on application of offshore mooring system, the market for West Africa is segmented into Floating Production, Storage and Offloading (FPSO) Vessels, Floating Drilling, Production, Storage and Offloading (FDPSO) Vessels, Floating Liquefied Natural Gas (FLNG) Vessels, Tension Leg Platform (TLP), Semi-submersibles, Spar platforms and others mooring systems. Offshore mooring is utilized for renewable energy generation for offshore including wave and tidal energy. West African region is dominated by oil and gas exploration, renewable energy sites are under survey stage and are set to get momentum during the forecast period. The forecast period considered in the report is from 2015 to 2024 wherein strategic analysis of the offshore mooring systems for West Africa has been provided. The report has been segmented by type, application, anchorage and country for the forecast period. Leading players in the offshore mooring systems market have been profiled with the market strategies adopted by them, company overview, financial overview, business segments, strategies and developments. The company’s included, but not limited to, are: SBM Offshore N.V., MDEC, Inc., Grup Servicii Petroliere S.A, Mampaey Offshore Industries B.V, FMC Technologies Inc., BW Offshore Ltd., Trelleborg Marine Systems, Timberland Equipment Ltd., Mooring Systems Inc., and Delmar Systems, Inc.